The U.S. dollar was higher across the board against major pairs on Friday. Trade war concerns rose heading into the weekend and the comments from U.S. President Donald Trump during the week sparked a rally of USD buying. Trump has been outspoken on NATO, trade and the Brexit deal while economic indicators and the US Fed have been supportive of the greenback. The Trump administration has said that it would add 10 percent tariffs on additional $200 billion Chinese goods if the Asian nation retaliates. U.S. Federal Reserve Chair Jerome Powell highlights the week with his semi-annual testimonies. The EUR/USD fell 0.80 in the last five sessions. 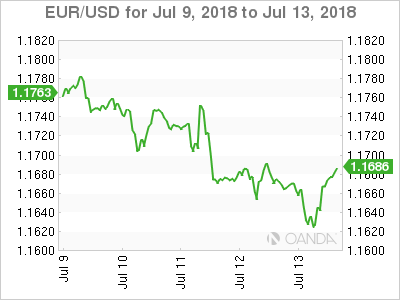 The single currency is trading at 1.1648 after the EUR lost ground in the first four days of the week only to mount a halfhearted recovery on Friday. The pair started the week trading at 1.1763 and will close at 1.1685. Hawkish Fed member rhetoric and strong inflation indicators in the U.S. did their part on the fundamental side, but with geopolitics playing such an important part, the focus of investors was on the ongoing trade war with China. The USD became a safe haven and attracted flows looking to hedge against uncertainty. The U.S. Federal Reserve has lifted interest rates twice already in 2018 and Fed members have been out in numbers endorsing one or two more additional hikes. The tone of the testimonies from Chair Powell to the congress and senate committees will guide the currency. European inflation data will be released on Wednesday and is expected to remain steady at 2.0 percent. U.S. retail sales data is expected to drop to a small gain of 0.4 percent, but the emphasis will be on Fed Chair Powell's testimony alongside other member comments during the week. The G20 financial summit will be held in Buenos Aires starting on Friday, July 20, which will be interning as trade spats have escalated to tariff wars but have yet to fully impact global markets. The USD/JPY gained 1.83 percent during the week. The currency pair is trading at 112.47 with the yen one of the biggest losers against the USD in the past five sessions. 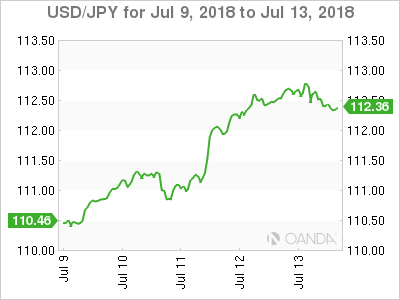 The Japanese currency shed its safe haven status as a major source of its exports has been targeted in the trade wars (auto) and the U.S. yield curve flattening making the greenback a more attractive destination. The USD/CAD gained 0.65 percent in the last five days. 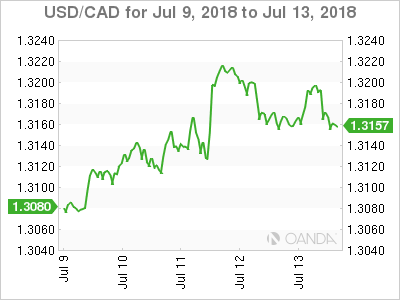 The currency pair is trading at 1.3174 even after the Bank of Canada (BoC) made the benchmark interest rate 25 basis points higher on Wednesday. The official rate is now 1.50 percent, closing the gap with the Fed funds rate alongside some hawkish forecasts of the economy by Governor Poloz. The main headwind for the loonie has been the current geopolitical climate, trade in particular. The Canadian economy is heavily dependent on its relationship with the U.S. and the Trump administration has been pushing for a deep NAFTA renegotiation in exchange to exempt Canada from other tariffs. The loonie got little support from oil prices with West Texas Intermediate falling since the higher-than-expected supplies coming online. The weekly inventories posted a large drawdown, but ends of disruption in Libya and a softer stance on Iranian oil by the U.S. are pushing crude prices down. U.S. officials are considering dipping into the oil receiver to prevent a sharp price increase. 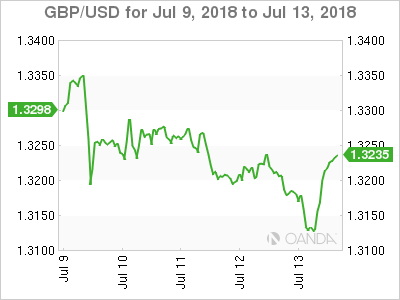 The GBP/USD lost 0.81 percent in the last week. The currency pair is trading at 1.3178 in the aftermath of a softer Brexit plan drafted by Prime Minister Theresa May was published. The strategy has already resulted in multiple resignations from hard-line Brexiteers in May's government but so far has been short on details. The EU withdrawal bill will be voted next week and then the U.K. government will sit down with the EU to keep hashing out the Brexit negotiation. U.K. data will be released that could end up putting the Bank of England (BoE) August rate hike out of reach. Labor data, inflation and retail sales are all due during the week. The Brexit negotiation continues to be a bumpy ride and that is only on the domestic side; EU negotiators might not agree with May's promises back home regardless of the political cost.